Should we consider this project in Breaking News category? This was not a planned news event for which we prepared months/weeks in advance to serve our audience with quick analysis and rich visualizations after an expected major data dump (e.g. elections, olympics, soccer World Cup) or when a periodic nature disaster happens (e.g. California wildfires). 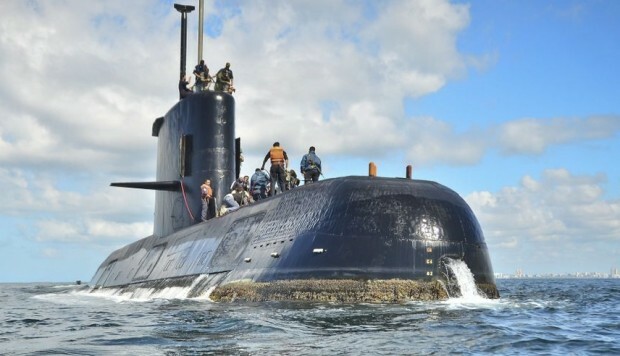 November 17th, the Navy informed the press about the disappearance of the submarine and the start of a rescue operation. Some optimistic hypothesis included communications problems. November 22nd – 7 pm, the first official indication was unveiled: a “hydroacoustic anomaly”, recorded hours after losing contact with the ship, almost 60 km from the place where the last communication took place on Wednesday the 15th at 7.30 am. The Navy began to map a specific search area and ordered the transfer of vessels and aircraft to that area. And that is the day were we start counting the breaking news data. Optimistic hypothesis vanished and the tragedy option gained credibility. From very early that November 22, LA NACION DATA started following the route of those vessels and their search without specific direction. Until 7 pm. What happened? When the Navy announced the hydroacoustic anomaly, we were ready to inform about the first boats that approached the new search area. From 7 pm until midnight we were able to show the raking that each ship made, within the search polygon marked by the Navy. 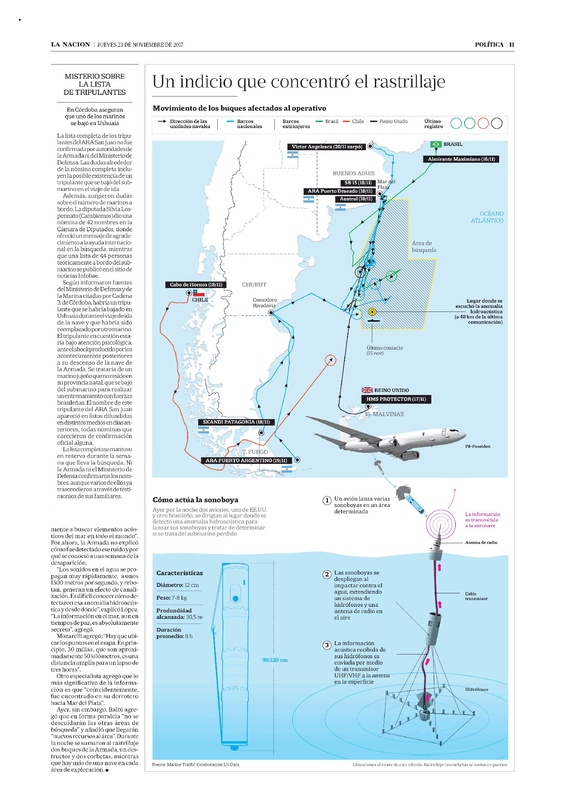 The result: we provided videos with the route of the boats to embed in all the notes that informed about the search a couple of hours after the navy Press conference; and a map we published on November 23rd print edition. So, LA NACION DATA had the exact location of each search vessel in real time. The search for the submarine was in a terrain unknown to all: the sea. That’s why we needed precise data about the location of the boats and the route each one made to rake as much as possible. And let what happened at sea, not just be there but on the screen of each reader. In LA NACION DATA we accessed the data to geolocate the ships that approached the search point with satellite update, and managed to visualize the route of the vassels and tankers arriving from Chile, Brazil, Africa, Antarctica and the coast of Argentina. This same day we made captures on the position of the ships to deliver visual and context material for the extensive coverage that took place this day. We also worked with the infographic team on a huge visualization that was going to be published next day. PRINT EDITION published during midnight Nov. 22nd and delivered to general public on November 23rd morning, within hours after the hydroacoustic anomaly was announced. At the moment in which the navy informed the participating vessels of the search operation, one of our team members reacted suggesting Marine Traffic as a real time data tool. This is for breaking news using data! We used the Marine Traffic database and set up a fleet with the vessels we knew (by official information from the Navy) that were approaching the search site. We could have worked through an API, but the breaking news hurried us and we decided to use other resources: video captures and static infographics. We were the only ones who accessed the route of each ship during the search. With the satellite update in real time we were able to report on the status of ships, such as the Sophie Siem (who had a rescue mini-submarine), that had to return to land to stock up. They were times of great uncertainty and every movement that made a boat was relevant. 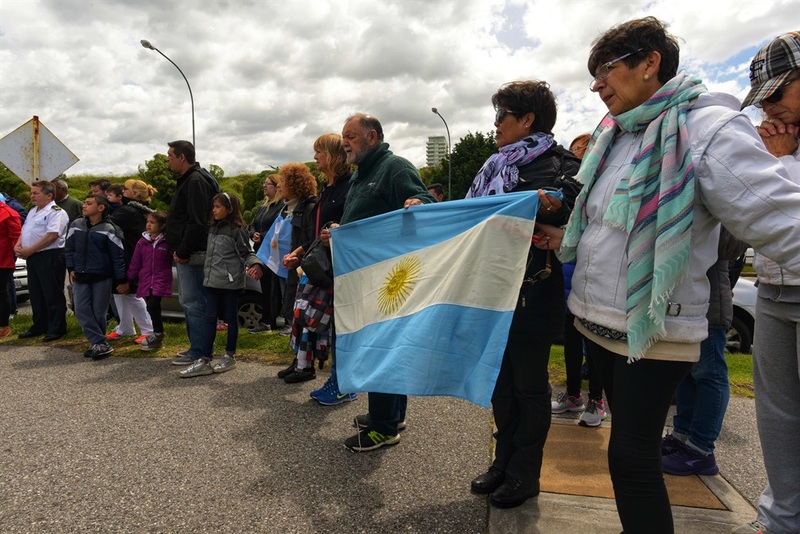 Esta entrada fue publicada en Sin categoría por cavila.